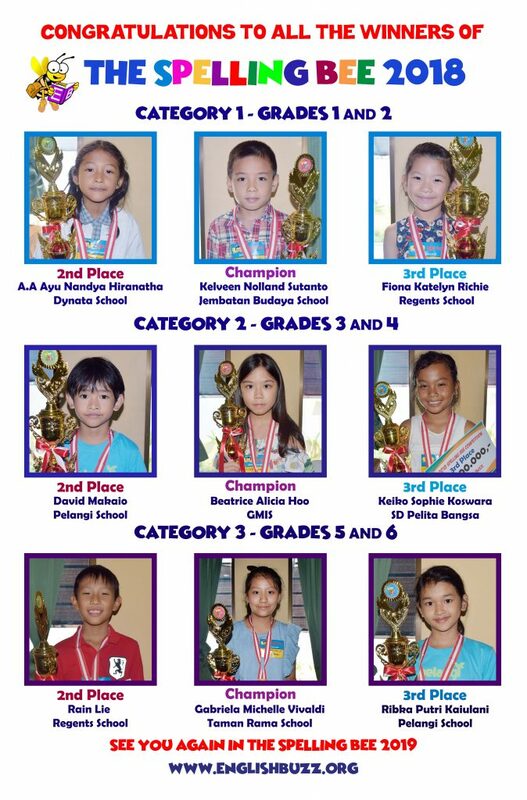 EB congratulates all the winners of the 2018 Spelling Bee Contest held last December 8, 2018 at Grand Santhi Hotel. Each winner received a trophy, a gift voucher and a cash prize worth Rp 200,000.- to Rp 500,000.00. 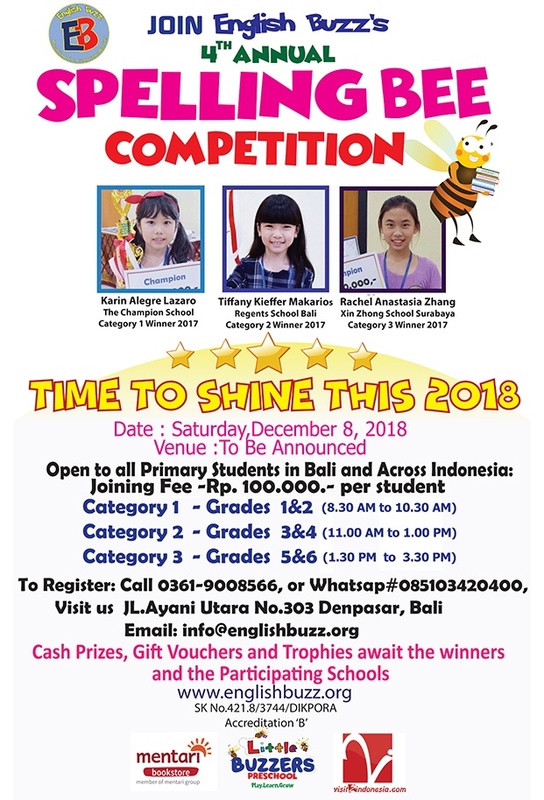 English Buzz holds this competition every year to assist young learners improve in their spelling, pronunciation and vocabulary skills as well to raise their confidence level, which is a part of EB’s commitment to all students. The next Spelling Bee (2019) will be held on December, which details to be announced soon. Spelling Bee 2018 is Here! Hear ye, hear ye! The long wait is over! Join our much awaited 2018 Spelling Bee Contest and be this year’s champion. Enjoy this fun-filled and exciting experience with language instructors that will definitely improve children’s spelling and speaking skills. Avail of our Early Bird Discounts and Promos from October 2-31, 2018. List of words will be published on the 1st of November, 2018 and will be sent via email to all participants. Call us for more information or just simply send us a private message in our FB or Instagram account and you’ll get a 100% response rate from us. Thank you. See you at the venue (to be announced). 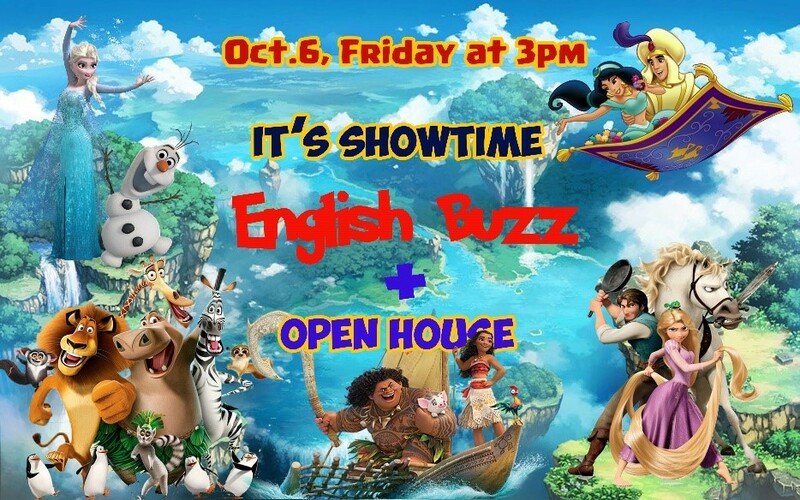 English Buzz will hold its annual event called ‘It’s Showtime’, on October 6, 2018- Saturday, wherein the students will showcase their talents and skills through singing (in English) and dancing, choreographed by our teachers. 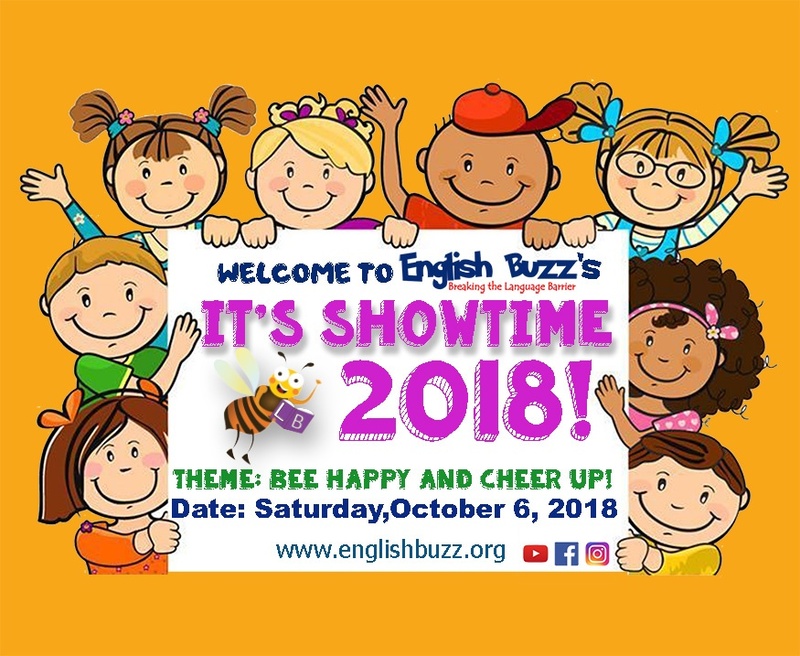 In this regard, we are inviting our family and friends to come, support and see the children's performances, and see how they progressed in their language skills at English Buzz. Our 2018 Summer Holiday Program is Back! We invite children ages 5 to 12 years to join our annual English Program during their summer break to learn English language at English Buzz. Our fee is very much affordable so as to encourage and assist local students learn a new language since English is not the main instruction at their schools. We offer fun and holistic activities to make language learning effective and exciting for young learners. 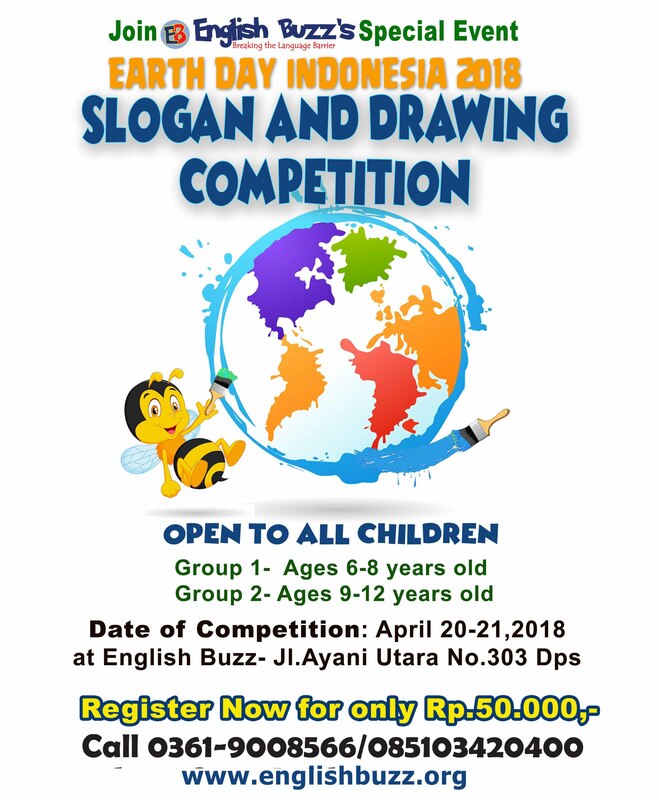 In connection with the worldwide celebration of Earth Day on April 22, 2018 which theme is to end plastic pollution, English Buzz invites your child to join our special event called “Earth Day Indonesia 2018- Slogan and Drawing Competition“ where in students (age 6-12 years old) will show their creativity by thinking and drawing on how to save the Earth-Bali. 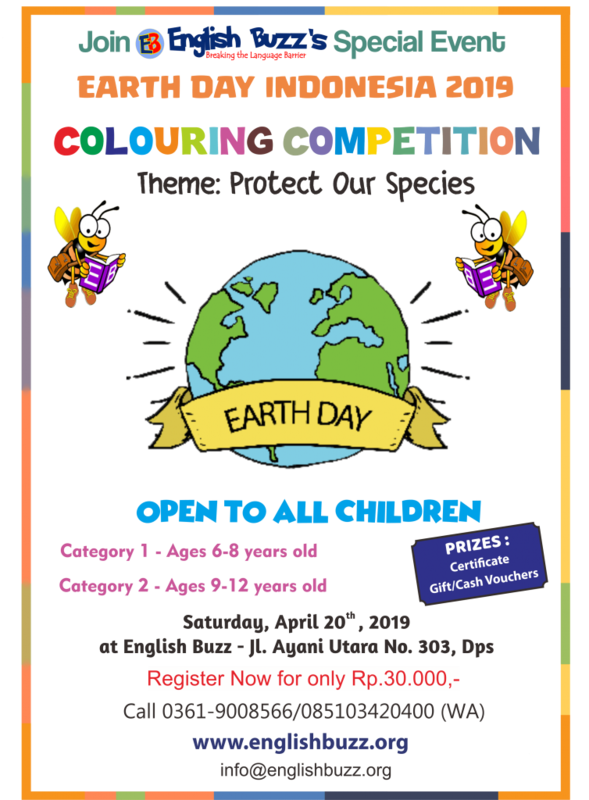 Not only will this contest creates awareness to young generation to help save the Earth but will also bring out their creativity and intelligence to expound on the topic. This will be held on April 20 and 21 between 12pm to 6pm. Each student is given 90 minutes for the activity. Registration Fee is only Rp 50.000.- /student. Prizes, Vouchers and Certificates await the winners. To register, please call or visit us directly or email us at info@englishbuzz.org. 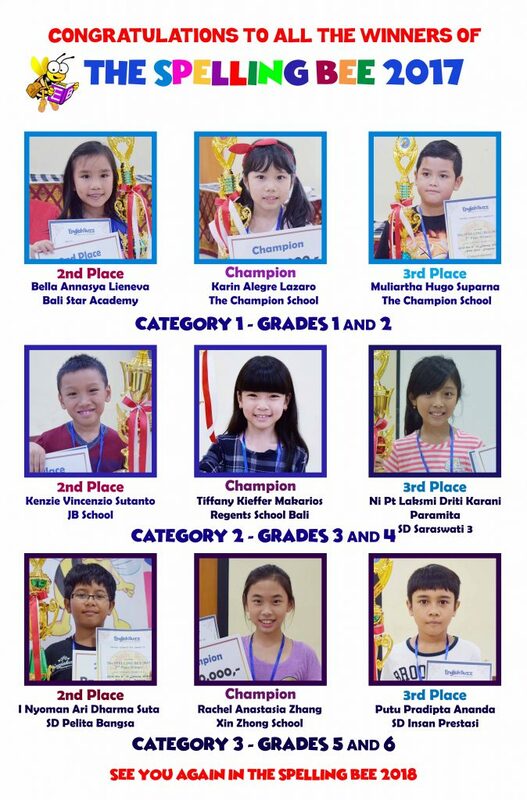 EB congratulates all the winners of the 2017 Spelling Bee Contest held last January 13, 2018 at Hotel Nikki Denpasar. Each winner received a trophy, a gift voucher and a cash prize worth Rp 250,000.- to Rp 750,000.00. More than 30 schools in Bali and Jawa (Surabaya and Malang) participated in this event. The next Spelling Bee (2018) will be held on November, which details to be announced soon. EB has recently concluded their 3rd Annual Showtime last Friday, October 3, 2017, at their school in Denpasar. This fun and exciting event is held to show students learnt skills in English by performing songs, reciting a poem, presenting a lesson and dancing to nursery rhymes, in front of an audience. Parents also participated in door prices and raffle draw in the said event. This way, students from Preschool to Grade six do not only practice what they have learnt at English Buzz but also a good way to be trained to show self-confidence and self-esteem. This year’s theme is based from Disney movie soundtrack which students and old-alike love to sing. Parents and friends witnessed this event to support their child’s language education. Here’s a gallery of this event. 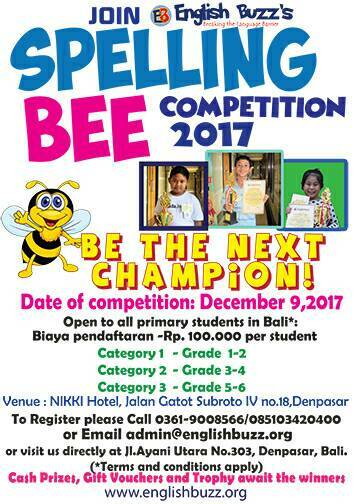 English Buzz invites all primary students in Bali to join their 3rd Annual Spelling Bee Competition to be held on December 9, 2017, at Hotel Nikki in Jl. Gatsu, Denpasar. A 10% discounted rate or Early Bird Promo for EBuzzers (students enrolled at English Buzz) is now available until November 15, 2017. Registration Fee is Rp 100.000.- per student. Schools participating in the event get a 4 + 1 (register 4 students + 1 free). Spelling List shall be given simultaneously on November 15 for the students to study. Cash prizes, Vouchers, and Trophies will be given to the winners.